Frugal innovations offer high customer value (core functionality, durability, ease of use) as well as significantly reduced costs of ownership compared with standard products and services. 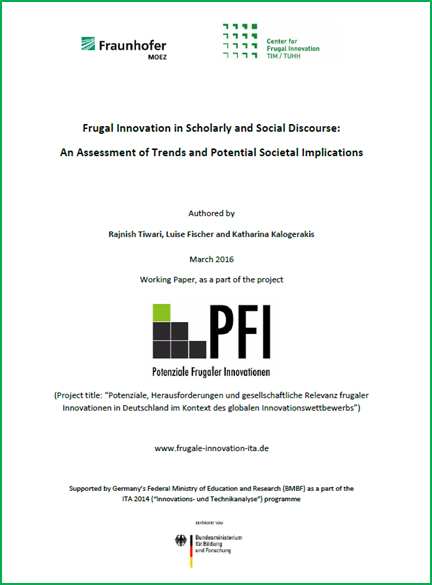 The phenomenon of frugal innovations was initially observed in emerging economies and the scholarly discourse still largely focuses on this context. Now there is increasing evidence that frugal solutions are also diffusing in the economically developed nations. 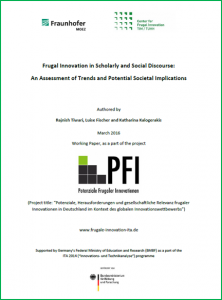 It is, however unclear, to what extent frugal innovations are relevant for industrial economies such as Germany in economic and socio-political contexts. This symposium is part of a larger research project funded by the BMBF as a part of its ITA (Innovations- und Technikanalysen) programme and entitled “Potentials, challenges and societal relevance of frugal innovations in the context of the global competition for innovation”. Project partners are the Fraunhofer Center for International Management and Knowledge Economy in Leipzig and the Institute for Technology and Innovation Management at the Hamburg University of Technology.